Venezuela is a country that has changed a lot since its golden years, those in which it was the symbolic capital of Latin America, due to its progress, drive and sustained economic growth. Today, Venezuela is the poorest country in the region. All this happened after 20 years of socialism. Rather than writing a reflection or analysis of this situation, I present some data that shows the radical changes from the era of democratic Venezuela of the 1980s, to the current Venezuela governed by Chavismo. 1979: The Saudi Venezuelans crowd the stores of New York. 2019: Venezuelans collect water from the sewers and rivers to bathe. 1979: During the process of registration of foreigners, the government announces that they will be granting residence visas to Colombians with more than five years in the country. 2019: More than one million Venezuelans are living in Colombia as refugees. 1979: The West Tower of the Central Park Complex is inaugurated. At the time it was the tallest skyscraper in Latin America. 2019: Water does not reach the buildings of Caracas. 1980: Color television transmissions are officially launched throughout the country. 2019: 115 media outlets have closed since the arrival of Nicolás Maduro to power. 1980: The decree launching the slogan “Buy Venezuelan” is published in Official Gazette No. 32,329, in order to reduce the number of imports to favor domestic companies. 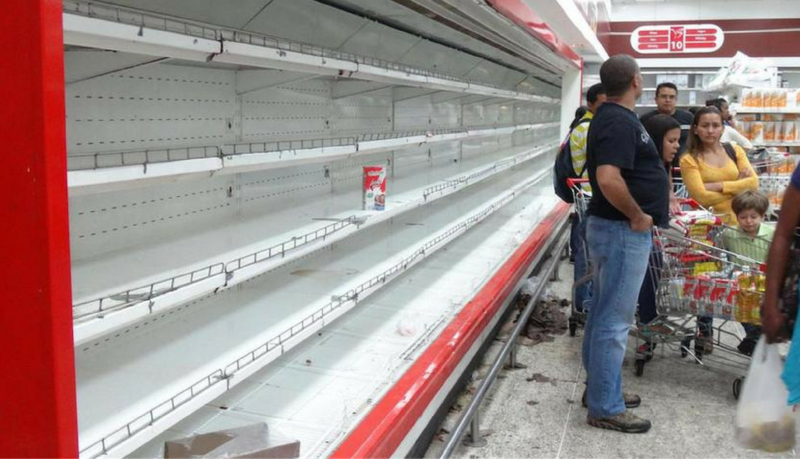 2019: Venezuela imports 75% of the food consumed in the country. 1980: The Camatagua II Land Station comes into operation, with which Venezuela already has full access to the Intelsat IV-A and Intelsat V satellite. 2019: State-controlled VTV, and the ruling government party, encourage citizens to plant their own food and raise pigs. 1980: The new Banco de Venezuela Building is inaugurated. 2019: Hyperinflation in Venezuela climbs to over 10,000,000%. 1981: The Military History Museum is created. 2019: The Military History Museum is converted into the Hugo Chávez Museum. 1982: After awarding Mario Vargas Llosa, Gabriel García Márquez, and Carlos Fuentes, Fernando del Paso receives the fourth edition of the Rómulo Gallegos Prize, awarding a prize of USD $100,000. 2019: The most important literary prize in Latin America was permanently suspended by the National Government. 1982: The Government institutes the food voucher, which consists of a donation of 100 bolivars for the most needy families of the population. 2019: Chavismo did not create social missions, public education, or food vouchers. 1982: The Children’s Museum opens its doors in Caracas. 2019: Children of Caracas eat from the garbage in the streets. 1982: Venevisión produces the first International Orchid Festival in the Maracaibo Bullring. Artists obtain trophies made from seven different minerals. 2019: Maracaibo registers blackouts of more than 4 days on 5 occasions. It also has no water supply. 1983: The Caracas Metro opens to the public with the inauguration of the first section of Line 1 between the Propatria and La Hoyada stations. 2019: Caracas metro service does not work due to lack of electricity. 1983: Plaza Caracas opens in the vicinity of the Simón Bolívar Center Towers. Its design is similar to that of the Piazza San Marco in Venice. 2019: Public spaces do not have lighting, painting, or basic services. 1983: Inauguration of the Teresa Carreño Theater with capacity for 2,900 people. It is the largest cultural complex in Venezuela and the second largest in South America. 2019: Government “redecorates” the Teresa Carreño theater, placing an industrial water tank at the entrance. 1983: Radio Caracas Television celebrates 30 years of broadcasts. 2019: Radio Caracas Televisión celebrates 12 years closed after the illegal expropriation of Hugo Chávez. 1984: After 48 years, teachers and professors manage to sign their first collective contract with the Ministry of Education. 2019: Salary of teachers and university professors is less than USD $10 per month. 1985: In the first visit of a Pope to Venezuela, John Paul II lands at 15:53 ​​from Rome. That day he holds a private interview with President Jaime Lusinchi. 2019: Pope Francis does not pronounce on the murders and torture of opponents of the Venezuelan government. 1985: Venezuela obtains the World Literacy Prize awarded by Unesco. 2019: Children of Venezuela must cross the border by trails to go to classes in towns and cities bordering Colombia. 1985: The Astronomy Research Center (CIDA) is officially launched, almost ten years after its creation. 2019: Venezuelans see the stars thanks to several days of blackouts nationwide. 1985: The construction of the Gran Mariscal de Ayacucho Highway begins, with completion envisaged by the beginning of 1988. The project is initially projected to be 30 km and cost 2 billion bolivares. 2019: Infrastructure and roads of Venezuela in ruins. 1985: By presidential decree, the minimum wage is set at 1500 bolivares monthly (USD $348 per month), with an official exchange rate of 4.30 bolivares to the dollar. 2019: By presidential decree, the minimum wage is set at 18,000 sovereign bolivars (USD $5.50 per month). 1986: In the El Ávila Clinic the first Venezuelan baby is born by in vitro fertilization, being only the second in Latin America. The operation was conducted by Dr. Juan Aller. 2019: 100 Venezuelans die every day due to lack of medication. 1986: The final stage of the Raúl Leoni Hydroelectric Complex enters into operation, which with an installed capacity of 10,235 MW becomes the largest hydroelectric power station in the world at the time. A year later, the “San Agatón” Hydroelectric Power Plant was inaugurated, the first stage of the “Leonardo Ruiz Pineda” Hydroelectric Generation Complex, belonging to the Uribante-Caparo Development of the CADAFE company. In 1988, work began on the construction of the Macagua II hydroelectric dam on the Caroní River. 1987: During the Copa Libertadores, the goalkeeper of Unión Atlético Táchira, scores a goal from his own side that contributes to the team’s 3: 2 victory over Independiente de Avellaneda. 1987: The first public phones paid with magnetic cards come into operation. 2019: Venezuelans can not communicate due to lack of telephone signal in the middle of blackouts. 1988: Televen begins its transmissions, by channel 10 (VHF) from Caracas. 2019: The television channels in Venezuela do not inform the people about what is happening in the country. 1989: Venezuela signs ILO Convention 169 on indigenous and tribal peoples, which extends several rights to indigenous communities. 2019: Bolivarian National Guard murders 25 Pemons during protests. 1989: The Carlos Cruz Díez Museum opens its doors. 2019: Work of Carlos Cruz Díez in the International Airport of Maiquetía is in a state of deterioration. 1989: The scientist Jacinto Convit receives the Abraham Horwitz Prize in Washington. 2019: They declare Francisco Convit as “fugitive” from the American justice system and release arrest warrant. Accused of laundering more than USD $1.2 billion from PDVSA. 1990: Petróleos de Venezuela acquires all of the shares of Citgo, an oil company in the United States, also becoming the company’s main subsidiary outside Venezuelan territory. 2019: CITGO is in default, owing more than USD $5.4 billion. 1990: Venezuela adheres to the Convention on the Rights of the Child. The date of entry into is October 13, 1990. 2019: Children in Venezuela die due to lack of medical supplies. 1990: Venezuela signs the General Agreement on Tariffs and Trade, a document that years later will give birth to the World Trade Organization. 2019: Merchants in Venezuela must modify the prices of their products daily, due to hyperinflation. 1991: The .ve domain is designated as the geographic top-level internet domain for Venezuela. 2019: Venezuela’s internet is the slowest on the continent. 1991: According to an article in Fortune magazine, Venezuela is the country with the highest rate of economic growth in Latin America. 2019: According to a report by the Heritage Foundation, Venezuela was ranked 179th out of 180 countries for economic freedom, registering a contraction of 44.3% of GDP since Nicolás Maduro took office in 2013. 1991: The process of privatization of the CANTV begins. The concession of 40% of the shares of the company is granted to the VenWorld Consortium, which had offered a tender of USD $1.9 billion. 2019: 12 years after Hugo Chávez returned to nationalize the company, the services provided by CANTV, telephony and internet, are extremely deficient, with many regions presenting service failures for days and months. Emmanuel Rincón is a Venezuelan lawyer and writer, and the author of five novels.